And our happiness can't be beat! Here are a dozen of our favorite double bills, celebrating family life and all its joys and woes, to get you past the "season to be jolly" and (hopefully) into the New Year. Two quirky indies with grrrl power to burn remind us how much fun Turkey Day can be! In Pieces of April, black sheep daughter (Katie Holmes) invites the whole family over to her NYC apartment, only to discover the oven doesn't work! Crazy hijinks ensue. And in House of Yes, Parker (Best of Show) Posey stars as "Jackie-O", spicing things up at her more-than-normal twin brother's "meet the fiance" Thanksgiving dinner party. Set during an unusually icy (in more ways than one)Thanksgiving holiday, The Ice Storm examines two dysfunctional families as they live out their empty existence in the suburban 70s in this strange, moody piece by director Ang (Crouching Tiger, Hidden Dragon) Lee. The Sweet Hereafter extends the cold journey and pushes it north as an unscrupulous lawyer (Big Night's Ian Holm) exploits the tragedy of a small Canadian community struggling to recover after a devastating loss. Perhaps an irreverent pairing, but the combined effect of these two holiday films is worth the potential disjuncture. A twisted tale of murder and mayhem, Who Slew Auntie Roo? takes a peek at the maternal obsessions of the always fabulous Shelley Winters. Lovingly directed by cult favorite Curtis Harrington, Auntie Roo also features actor Hugh Griffith as "The Pigman." And a Norman Rockwell holiday (complete with happy ending) will be yours to cherish in A Christmas Story, a jaunty portrait of Middle America in the 40s, with screenplay by Jean Shepard. Cute kids going through hard times in these classic (but relatively unknown) stories set in magical, marvelous New York City. Peter Sellers shines (especially in his scenes with comedienne extraordinaire Paula Prentiss) as the title character in The World of Henry Orient, where he is pursued by two adolescent schoolgirls impersonating the daughters of Jane Mansfield (among other mischievous pranks). And Jason Robards is the dad we all wished was ours in A Thousand Clowns, which also features a great supporting role by Martin Balsam as Robard's responsible, but still wacky, brother and best friend. Be sure to get in some Chippie Chipmunk Chips for this one! ‘Tis the season to be jolly and everyone is trying, but reality is closer to a nightmare than to a dream for those down on their luck. In the first film, starring the incomparable Gary (Pow Wow Highway) Farmer, two homeless men in Canada join forces to exploit the only possession they own - an electric space heater. By contrast, hot and humid Buenos Aires is the setting for Felicidades, where nothing seems to be going well for anyone this Xmas Eve. Comedy and drama combine in these poignant studies of family disfunction, alcoholism and abuse (with a bit of brotherly love thrown in for good measure). 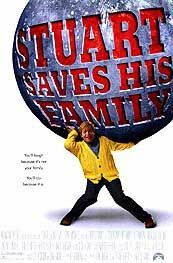 In Stuart Saves the Family, Al (Air America) Franken reprises his wonderfully kitchy Saturday Night Live role of Stuart Smalley, new-age TV host and all-round good guy, trying to keep it together with affirmations (and a big box of fig newtons) as his family slowly self-destructs. 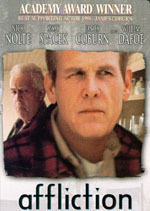 And in Affliction, Nick Nolte has the role of a life-time in his portrayal of the dutiful son, as Willem Dafoe (the prodigal) narrates from off-screen. Okay, so it's not Kwaanza, but birthdays are for celebrating, too! And in Celebration, by Dogma 95 director Thomas Vinterberg, things take a very nasty turn when some very unpleasant secrets surface about the family patriarch. And although not quite as traumatic in content, Cedric (L'Auberge Espanol) Klapisch's Un Aire de Famille takes a close look at the vicious politics and petty squabbling that mar the birthday of one of the members of a typical French family. The classic and its antithesis. Both fans of Jimmie Stewart AND William Burroughs will be delighted! See Joan Crawford scream. See Faye Dunaway as Joan Crawford scream. Be afraid, be very, very afraid. Here are a couple that are absolutely guaranteed to be kid-friendly (but "yule" love ‘em, too). Who can resist celebrating with Pee Wee Herman and all his friends! With special guest stars Grace Jones, Frankie Avalon, Annette Funicello, Magic Johnson, Zsa Zsa Gabor and CHARO (to mention just a few) it'll be a rockin' fun Xmas! And just in case you can't resist being educational as well as entertaining in choosing your child's film fare, in Fay's 12 Days of Xmas, video artist and photographer William Wegman watches Weimariners Fay Ray, Batty, Chundo and Crooky decorating their doggy digs while having fun with numbers and shapes! Another unlikely pairing, but, heck, they're both British, so who cares? Billy Elliot charts theunlikely rise of a young boy from the poverty-stricken mines of the North Country to the London ballet stage. Notable here for its heartbreaking holiday scene, when, in order to keep warm during the coal strike, the family resorts to the unthinkable (while wearing party hats and eating cake). And Dicken's classic tale of kindness, truth and virtue in the Victorian Age is completely mucked up in Rowan (Mr. Bean) Atkinson's version, when the Black Adder and Baldrick show up for the festivities. And here are a couple to make resolutions by. Los Angeles-based indie director Henry Jaglom (whose recently released film Shopping is due to open soon at the Guild Cinema) scores again with this tale of love and mid-life crisis in a New York City sublet. And sad-sack bachelor Jack Lemmon woos Shirley MacLaine's reluctant "Miss Kubelik" in Billy Wilder's comic tale of life on the corporate ladder. Co-starring Fred (My Three Sons) MacMurray as the boss.